Last week, my older son found a recipe for Butternut Squash Gnocchi With Sage Brown Butter. He had been idling in the kitchen after school one afternoon, waiting for me to finish making dinner, and picked up a copy of the October issue of Bon Appetit that was sitting on the counter. We have let many magazine subscriptions lapse in our house---Vanity Fair, Forbes, Architectural Digest, Allure, Cook's Illustrated---but Bon Appetit is the one magazine I will never stop subscribing to, even though I let the issues pile up and get covered with food, and it's often months before I actually make something. But when I do, I'm always glad because the recipes are almost fool-proof and rarely violate my cardinal rules of cooking: No more than ten ingredients or an hour of work. I was glad my older son had busied himself with a magazine about food. This was infinitely better than busying himself with Facebook or video games. But the recipe he found came from Lidia Bastianich (owner of Felidia and Becco, among other restaurants, and author of several cookbooks)---in other words, a real chef with a large staff to do her prep work. I had read the story about Bastianich, glanced at the recipes she provided based on her memories of her childhood in Trieste, and closed the magazine. I love reading about chefs and pretty much revel in anyone's childhood memories, but chefs' recipes are rarely for the faint-hearted. The gnocchi recipe called for a potato ricer, which we didn't have. It also took four hours to prepare. As Liz Lemon would say, That's a deal breaker. "Oh yeah, I saw that," I said to my older son. "Can we make it?" he asked, "we" meaning of course, you, Mom. "Well," I said. "I guess so." We got busy, and we didn't. Then, I started to feel guilty. Everyone in our family likes food associated with fall. They like squash soup, pumpkins and sweet potatoes. Once upon a time, I made pumpkin pie from scratch. And before the hot water heater flooded the basement and ruined everything in the storage room, we had a table full of stuffed and plastic pumpkins for Halloween. Plus, until recently, my husband pronounced "gnocchi" "GINOCKY." I found this sweet. It's "NO KEY," I would say, whenever he pointed it out on a menu and asked me if he liked it. We bought the squash the recipe called for. But a large squash sitting on top of the microwave is sort of like your dog waiting for dinner: After a while, it seems too cruel to ignore it. Then my friend from Tennessee came to visit. This woman has been my close friend since fourth grade. I won't date myself here but let's just say we've known each other since Nixon was in office (I remember this because her parents voted for him and mine didn't.). As a gift, she brought us a package of biscuit mix, two jars of blueberry and peach preserves, and three biscuit cutters from the Loveless Cafe in Nashville. The biscuits called for buttermilk, which I happened to have in the freezer, left over from another recipe I had planned to make but didn't. My friend had a bar mitzvah to go while she was in New Jersey. We were having our first, second and third cousins over for brunch. I thought I should make something other than a trip to Bagel Chateau. So before my friend left for her own post bar mitzvah brunch at a local hotel, we stood in the kitchen and made biscuits. All we had to do was add buttermilk to the biscuit powder, mix it up and roll out the dough. The dough was ridiculously sticky and I kept asking my friend to re-read the directions on the bag. "Are we doing this right?" I asked. "I don't know," she said. "I never made them." Fantastic. We kept adding more flour. The dough was sticky as hell but I was sick of standing there so I got out my rolling pin. The pin was a bridal shower gift from a woman I haven't seen since the beginning of the first Clinton Administration. 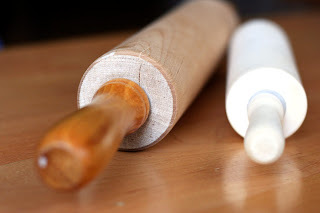 This woman used to be married to the brother of another friend from elementary school, and the rolling pin still comes in handy, forgive the pun. I started to roll out the dough. We ended up adding about two cups of flour just to get it to flatten out. Just as I was totally covered in flour and cursing, my friend left for her brunch, leaving me to cut out the biscuits, stick them in the oven, and melt the butter that would go on top of them. Later in the day, after the relatives had cleared out, I lay down on my bed, read the Style section, felt a surge of energy and decided to make the gnocchi. I had spent the morning with sticky dough and a rolling pin. Why not spend the bulk of the afternoon? I could use the grating blade on the Cuisinart instead of a potato ricer. While I was cooking, my older son wandered into the kitchen and helped me pour flour in the bowl. Then he asked, "What are you making again?" Very deep sigh. I kept cooking. The gnocchi was delicious, heavy and buttery. It was a great way to spend a Sunday afternoon but pace yourself---you could probably run a marathon in the same time it takes to make this dish. Pre-heat oven to 400 degrees. Cut squash in half length-wise, discard seeds. Put squash halves on baking sheet with skin side down, brush with oil and cook for 1.5 hours. Cool for a minute or two and then scoop out squash into the food processor. Puree for a couple of minutes, then transfer to saucepan. Cook for five minutes on low heat. Transfer to bowl and set aside. Do not clean food processor. put in food processor. Let cool then add to squash. Mix squash, potato, egg, nutmeg, salt and 1/2 cup Parmesan in a bowl. Gradually add 1 1/4 cups flour. Knead gently until dough is in a soft ball and almost smooth (it will stay lumpy.) Put flour on a flat surface and turn dough onto it. Divide dough into eight balls. Line two large baking sheets with wax paper. Sprinkle flour on wax paper. Take the eight balls of dough. Roll out each one separately, and separate it into little balls, about 3/4 inch across (like meat balls.) Dip each ball into a bowl of flour and roll it around. Put the balls on the sheet, cover with plastic wrap and place in refrigerator for an hour or freezer for 40 minutes (I used the freezer.) Keep sheets on side. While the gnocchi is chilling, put up two large pots of water to boil. Add salt to water. Once water is boiling, drop in gnocchi and let them cook for 15-17 minutes. Use a slotted spoon and transfer gnocchi back to the sheets. Chop sage. Heat a stick of butter in a LARGE saute pan for 3-4 minutes. Add sage and cook for one more minute. Add the gnocchi and saute them for seven minutes---longer if you like them crispy. Flip them at least once. Remove to a bowl or platter, season with salt and pepper and add 1/4 cup Parmesan. Serve immediately. Terrific piece, Flawed Mom. And chef's recipes: Oy vey!